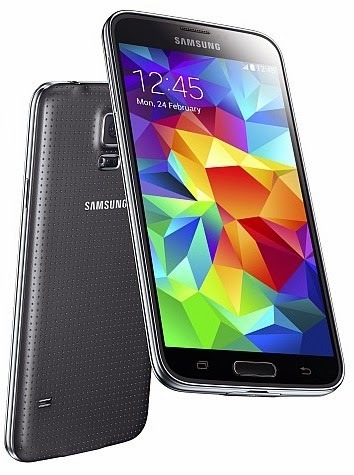 We’ve been hearing about the Galaxy S5 unofficially for months now. Today Samsung finally confirmed the device and we finally got to see the technology we've been talking about since last year. The Galaxy S5 packs a 5.1-inch full HD Super AMOLED display that uses the ambient light sensor to automatically adjust not only brightness but also color, so viewing your phone's display in the bright sunshine isn't just about cranking the brightness all the way up. The phone runs on a 2.5 GHz Snapdragon processor, although Samsung hasn't yet specified which one, and packs a 16-megapixel camera with real-time HDR (so you can preview your photo with and without HDR before you take it). This HDR feature also applies to video. The camera can also autofocus in 0.3 seconds, and a new selective focus feature allows you to blur out objects in the background for a more 'professional' look to your photos. That might make professional photographers cringe, but users that take photos almost exclusively on their phones have been craving the ability to tweak the depth-of-field, even if it is artificially shallow. The fingerprint sensor is exactly as rumored and can be used to securely unlock the phone, but also for Private Mode, which allows you to protect certain documents, photos, or other content. As reported last week, the fingerprint sensor is built into the home key and requires you to swipe downwards across the entire button to record your print. It can also be used for secure PayPal login. Samsung is also highlighting health and fitness with the GS5. The phone comes with a fitness tracker, a heart rate sensor (via the LED on the back of the phone, underneath the camera), and a nutrition tracker, all managed via Samsung's S Health app. The phone is also IP67 dust and water resistant, so you don't need to worry about damaging the phone when you take it hiking with you. The S5 supports LTE Category 4 (150 Mbps), includes 802.11ac WiFi (2x2 MIMO), and can combine LTE and WiFi in what Samsung calls 'download booster' mode. It comes with a 2800 mAh battery, which the company claims provides 10 hours of web browsing over LTE and 12 hours of video playback. The phone itself looks very much like previous iterations of the Galaxy S phones. It's got a soft touch, perforated backing and is available in electric blue, black, white and gold, but Samsung is promising designer covers as well, so you're not limited to the cover you buy. The Galaxy S5 will hit on April 11 in 150 countries. This is quite a departure from Samsung's usual tack of launching in one territory at a time. No word on pricing yet, but we'll keep you posted!